* processes) from sending protected broadcasts. // its activities from the history stack. // Add to the sticky list if requested. // Figure out who all will receive this broadcast. 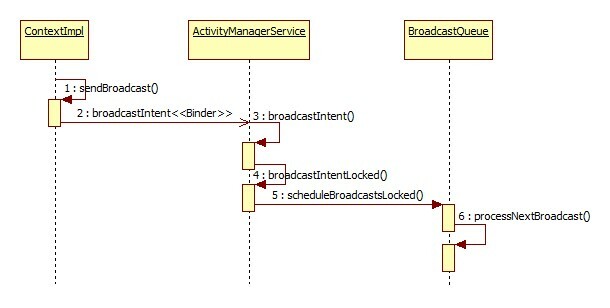 if (DEBUG_BROADCAST) Slog.v(TAG, "Schedule broadcasts ["
// check that the process we're waiting for still exists. + mQueueName + "]: waiting for "
+ mQueueName + "] sending broadcast result of "
if (DEBUG_BROADCAST_LIGHT) Slog.v(TAG, "Finished with ordered broadcast "
+ mQueueName + "] to registered "
// If the target process is crashing, just skip it. // Broadcast is being executed, its package can't be stopped. // Is this receiver's application already running? // applies transaction ordering per object for such calls. // but we still need to tell the activity manager we are done. // pm is in same process, this will never happen. // Is delivery being limited to filters owned by a particular package? // Do we already have this one?